You should not believe that HealthcareGovTool is an add-on that will help you navigate the Healthcare Marketplace (healthcare.gov), because it will do no such thing. Instead of acting as a helpful tool, the suspicious program actually resembles more of an advertisement-supported program, because right after installation the program activates various online ads. If you do not remove HealthcareGovTool, you will not be able to shake off the suspicious pop-ups and banners. 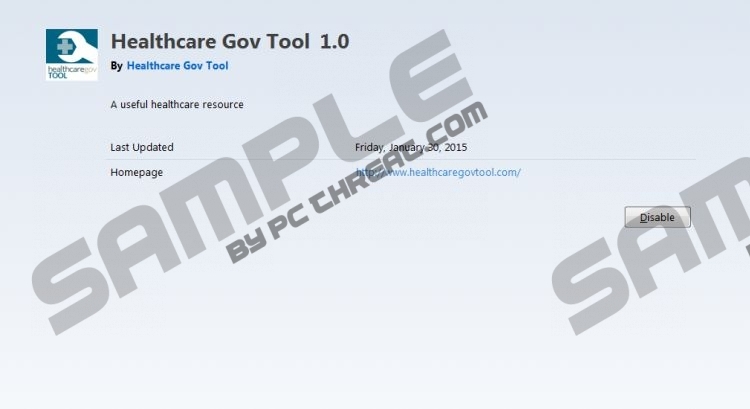 The program offered at healthcaregovtool.com can also be installed on your PC with software bundles. HealthcareGovTool could be installed with the potentially unwanted program MyPCBackup, ad-supported programs PastaQuotes or PriceFountain, and other undesirable apps that could also require removal. Since these programs could be presented as reliable tools and some programs could be installed silently, we recommend trusting a malware scanner to help you figure out which of them require removal. Needless to say, if you do not delete HealthcareGovTool and the associated computer threats, your virtual security will not be guarded. If you find files that are signed by P4hostcom, it is most likely that these files are associated with the suspicious HealthcareGovTool. You can delete these files to eliminate the suspicious ad-supported program from your PC, but this is not the only way to eliminate it. Are you willing to put up with the suspicious pop-ups and banner ads and ignore the activity of adware just because you do not want to deal with the removal? We can assure you that it is much safer to remove HealthcareGovTool than to ignore it. Even though the program is not extremely dangerous, it could pose some risks. The removal of HealthcareGovTool should not put you through too much trouble, and it is likely that you will get rid of the program successfully when you uninstall it. The removal – as you can see in the guide below – is straightforward, but if you have questions or concerns, you can always use the comment section below to contact us. Note that while manual removal is great when deleting HealthcareGovTool, other programs might be more complex, and you probably should trust automated malware removal software to delete them. Navigate to the Taskbar and click Start to open a menu. Go to Change or Remove Programs. Launch RUN by simultaneously tapping the Win+R keys. Type Control Panel into the Open box and select OK.
Go to Uninstall a program to find the installed software. Quick & tested solution for HealthcareGovTool removal.